Every business has an important value proposition to make for its prospective customers. In the case of a fee-for-service medical or dental practice, doctors must focus on several points of validation for themselves and their practice in addition to explaining the value of procedures and services. It can get complicated, and a practice's message can get muddied quickly if you don't keep your message on point. Luckily, search engines deliver focused content for users. This is why your organic search visitors have the best user experience on your website. And the users having the best experience on your site are the most likely to contact you. So, making the best impression on search engines is a strong key to successful marketing. This isn't news. For years, most practices have sought high organic rankings on search engines. 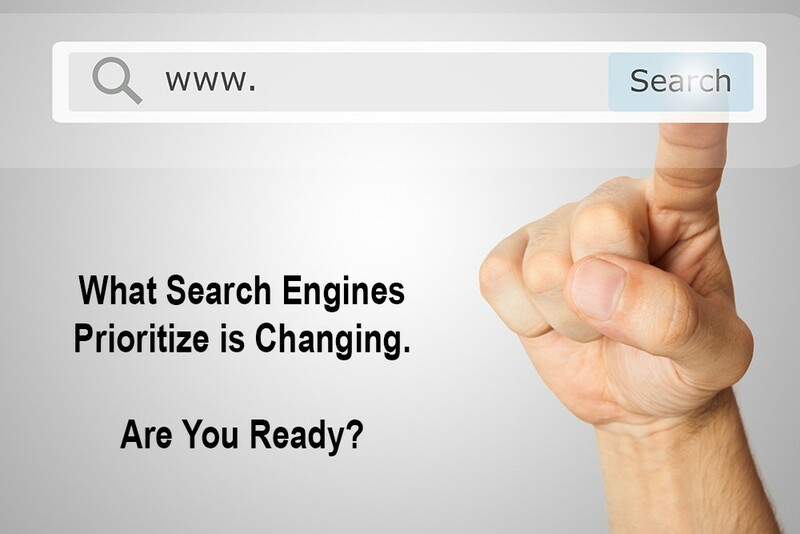 However, search engines have changed and so has the way people use them. For the last several years, search engines have focused on quality and relevance. Old-school strategies like keyword stuffing and volume bulldozing of repetitive content may have worked 10 years ago, but they only get you penalized now. Today, to get the favor of search engines, you must be relevant, new, interesting and result in a good user experience. Google knows when a user clicks through and is satisfied with the results. It also knows when someone clicks through to your site and has a bad experience. So, your content quality is vital. You have to think about what search engines want in order to make the paradigm change necessary to improve your search engine marketing. A search engine wants ... What? It wants to be your trusted portal to the Internet. In other words, a search engine wants you to use it again and again. This is accomplished when you have satisfying results for searches. To gain this understanding of the customer, search engines have changed over the last few years to be more like the users themselves. When you search, what do you want to see? Answer: As much as possible so you can get what you in need as quickly as possible. With this knowledge in hand, search results have changed and will continue to evolve in the direction of quality and relevance. That means rich content. It's what you want, so it's what they will show first. You are seeing it already and probably don't even notice it. But I bet you like it. Here are some examples of how rich content is populating search, showing up even before search results: https://developers.google.com/search/docs/guides/search-features. Get it now? Rich content results are more interesting and informative. So, ask yourself, for search engines, are you misplacing your message by focusing entirely on rankings? Like ads and maps, yet another kind of content has pushed in front of your rankings. However, if you have made the proper investment in a content strategy, you have what it takes to jump up over all the rankings on searches. In July, Dog Star Media introduced a new program called Search Appearance Optimization. This program takes your existing content (blogs, videos, etc.) and submits to search engines using structured data. In other words, we tell search engines that your new, relevant and focused content is the kind of rich content that belongs at the top of the search results. This program is easy and affordable and directly impacts your appearance in searches. If you have not made an investment in website content, this is your urgent warning to prioritize that. Otherwise, your message is going to get lost right where you want it ranked, well below the more relevant, rich content that has jumped over your site listing. A paradigm shift is necessary to marketing your website online successfully. You have to keep up with the times. The core of your online marketing needs to be new content generation. Adding this content sends all the right messages to search engines about the relevance of your site. And our ability to move that content into visible positions on social media and search engines, especially now through structured data, makes that new content that much important. You have to ask yourself if your message is getting lost with all the changes in how rich content is now favored. This is a form of noise you can eliminate by adopting a content-first approach to online marketing. Are you ready to learn how to do this? Dog Star Media can help you. All our marketing programs are based in new content. Our Social Media Content Program, our SEO Content Program and our Video Programs all produce content that can be used with structured data on search engines. That's double the bang for your buck with every video and blog. If you are interested in learning more, contact me at Donald@dogstarmedia.com.